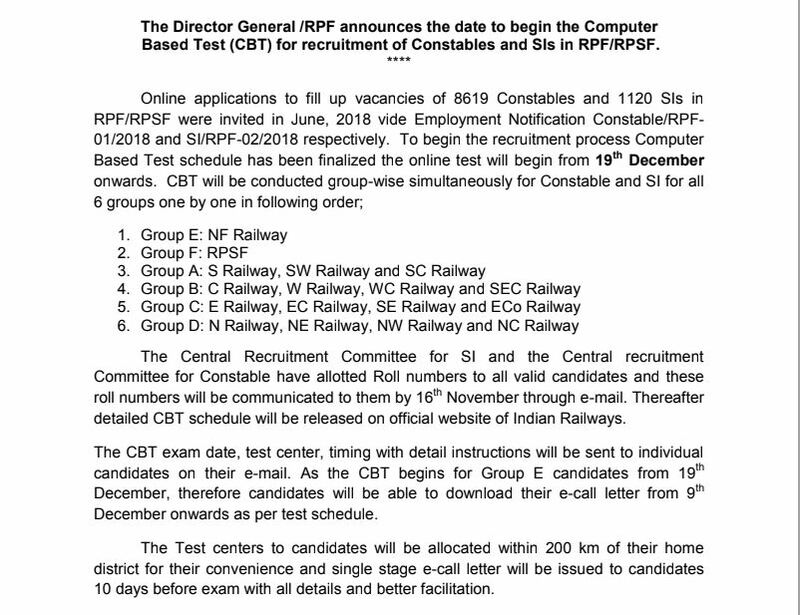 Railway Protection Force released the notification earlier about the RPF SI Constable Exam Dates to be starting from 19th December 2018. The candidates who are appearing for it will receive the RPF Admit Card from 9th December 2018. Along with this notice, the announcement of RPF Roll Number 2018 was also made. The valid candidates will receive their RPF Roll Numbers on 16th November 2018 (as mentioned in the notice). Later the update was made about the RPF Roll Number being announced on 15th November 2018. RPF Roll Number is the most important detail for the candidate appearing in the Railway Protection Force Exam for SI and Constable. The candidate would be required to enter the Roll Number during the Examination on their papers as for Identification Purpose. The RPF Admit Card also mentions the Roll Number of the candidate but this time, RPF is sending the Roll Numbers via Email ID today on 15th November 2018. The candidates will receive the Email from RPF on their Registered Email ID provided at the time of Registration.